There are many swimming pool dangers that homeowners and pool guests should be aware of in order to minimize the risks associated with this popular recreational and exercise activity. A visit to a family or public swimming pool is a popular summer event, and many warmer regions have open pools throughout the year. 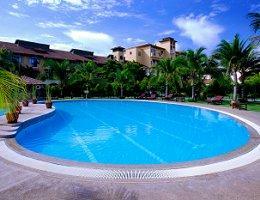 Furthermore, pools are common features of hotels, cruise ships, resorts and fitness centers. But while they may be popular, pools can also be dangerous. This overview of the most common swimming pool dangers can help pool guests minimize risks and still have a splashing good time. Hundreds of people - many of them young children - are injured or killed in swimming pool accidents each year. There are many types of dangers to be aware of, but fortunately there are also many precautions that can virtually eliminate the risks associated with pools. Install pool safety fences and covers to limit pool access. Arrange swimming lessons for everyone who will use the pool. Always supervise children while the pool is being used. Be aware of the pool depth and follow "no diving" restrictions in shallow pools. Stress proper pool behavior and limit horseplay. Refrain from using a pool if you are sick or have an open wound. Do not allow children wearing diapers to use the pool unless they are wearing swim diapers. Use a shower or hose to rinse your entire body before and after using the pool. Avoid swimming pools that appear to have questionable cleanliness standards. Keep chemical treatments at the proper level. Do not increase chemical treatments to compensate for a dirty pool. Follow instructions carefully when treating a pool. Keep pool chemicals properly stored and out of reach of children to avoid accidental poisonings. Store chemicals in a cool, dry place to avoid landscape contamination or risk of fire. Do not keep ungrounded electrical equipment - stereos, grills, lawn equipment, etc. - near the pool. Use only ground circuit fault interrupter (GCFI) outlets in the pool area. Stay out of the pool during lightning storms. Do not drink alcohol when swimming because it can impair the ability to judge distances as well as the physical coordination necessary to swim. Do not swim for at least 30 minutes after consuming a heavy meal. Do not use glass containers or sharp utensils in the pool area. Keep food out of the pool to avoid overtaxing the filtration system. Stay in shaded lounging areas when not in the pool. Apply water-resistant sunscreen every two hours while using the pool. Avoid staying in the sun in the late morning and afternoon hours when the sun's rays are strongest. Wear swimsuit covers to limit the amount of exposed skin. Use only toys designed for use in swimming pools. Store toys away from the pool area when not in use. Pool toys, including water wings, are not meant to be used as lifesaving devices and are not substitutes for flotation devices. Inspect the pool regularly for weak points, tears or punctures. Do not exceed the recommended weight and other use tolerances for the pool. Anchor the pool securely in a flat, stable location to prevent tips. Drain the pool daily to avoid contamination from standing water. There are many different swimming pool dangers that swimmers face regularly, but with proper precautions and common sense many risks can be minimized while still maximizing the enjoyment of a fun day at the pool.